Clare's Cottage01291 641856work Self-cateringPet friendly Clare's Cottage sleeps up to 4 in two bedrooms. It has a spacious lounge with a comfortable, cosy atmosphere and a country 'must have' of a wood-burning stove. There is a separate fully fitted kitchen with a small breakfast table and views to the garden and bird feeding area. A Double bedroom and a single bedroom both with room for a 'put you up' to allow for flexible sleeping arrangements, plus a bathroom with a bath an overhead shower. The cottage is heated by an Eco Friendly Biomass boiler and solar panels. Outside there is a delightful south facing cottage garden filled with flowers, perfect for relaxing and enjoying the fabulous views. It also has the convenience of an outdoor tap ideal for washing off muddy boots or paws. Being only 3 miles from the popular border town of Chepstow its position is handy to explore Monmouthshire, Wye Valley, Forest of Dean and the Brecon Beacons National Park. For a different cultural experience, Cardiff, Bristol and Bath can be easily reached within 45 minutes by car. Nearby are 3 local pubs, two of which serve food and allow dogs inside. Off road parking and lockable storage for bikes if required. Pet friendly Clare's Cottage sleeps up to 4 in two bedrooms. It has a spacious lounge with a comfortable, cosy atmosphere and a country 'must have' of a wood-burning stove. There is a separate fully fitted kitchen with a small breakfast table and views to the garden and bird feeding area. A Double bedroom and a single bedroom both with room for a 'put you up' to allow for flexible sleeping arrangements, plus a bathroom with a bath an overhead shower. 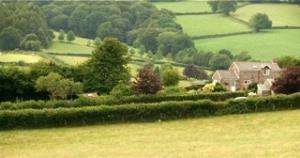 The cottage is heated by an Eco Friendly Biomass boiler and solar panels. Off Road parking Bike Storage available. Outside tap Babysitting available by prior arrangement Children welcome from any age.